If there’s anyone who has mastered the art of making casual hairstyles look chic, it’s Kathryn Bernardo. 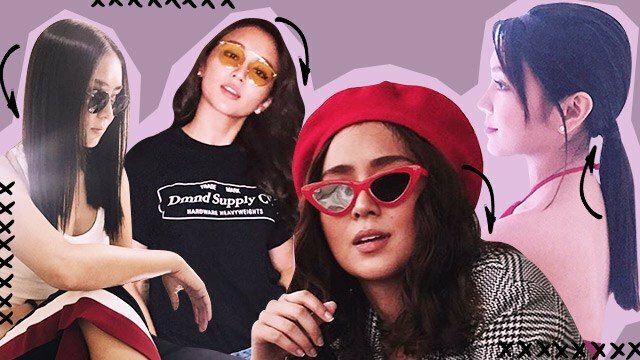 From loose curls to slick ponytails, the Teen Queen has an effortless sense of style that even we can pull off at school. Read on to know about her hair secrets, favorite go-to hairstyles, and ways on how you can do them on your own. To achieve it, she blow-dries her hair in the cold setting to prevent hair damage. Then she braids sections of her hair and leaves them for a few minutes. Afterwards, she runs her fingers through her locks to get that natural wavy look. This is ideal for girls who don’t have the time to use a curling iron. Look neat and chic by pulling off Kathryn’s low pony. She keeps it classy by gathering her locks on the nape of her neck and leaving some strands loose to frame her face. It’s a good way to look put-together minus the effort. For days when you can't be bothered about styling your hair, try Kathryn's pin-straight locks. Part your locks in the middle and let them frame your face for that casual, model off-duty look. This style works best when paired with low-key but stylish fashion pieces, too. Go and try this hairstyle if you want to add a bit of glam to your look. Don’t have time to iron your hair? Put it on a low bun for an hour (or sleep on it!) and loosen the waves afterwards. For more information about Sunsilk, head to their Facebook page. You can also get your own bottle by clicking here.